Myxofibrosarcoma is a malignant fibroblastic soft tissue neoplasm containing a variable amount of myxoid stroma that commonly presents as a slow-growing mass in elderly patients. The neoplasm may be superficial or deep to the muscle fascia and characteristically has an infiltrative growth pattern with a dominant or multinodular mass. We describe an unusual case of high-grade myxofibrosarcoma of the wrist and forearm that infiltrated the muscles, tendons, and wrist joint, causing bone erosions. The tumor was mistakenly diagnosed as synovitis and a chronic, erosive, inflammatory process. The diffuse nature, absence of a dominant mass, and radiographic appearance complicated the diagnosis. 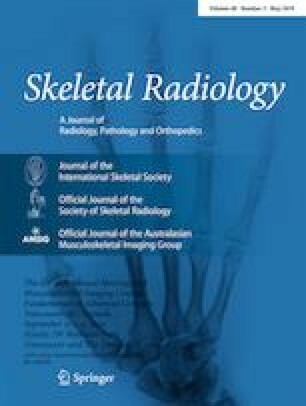 Although neoplasms of the synovial spaces are rare, this case demonstrates that tumors with a highly infiltrative growth pattern can mimic inflammatory synovitis and that neoplasms should be considered in the differential diagnosis when clinical and laboratory features are discordant with the imaging appearance. We thank Megan Griffiths for her editorial assistance.